A visit to Jesus’ rectory… | ARISE! LET US BE GOING! ← Flores for the Immaculate Conception Annuntio vobis gaudium magnum ed.? The priest’s house, you know, the rectory, you know, the presbytery for the pre-Edwardian crowd, or parsonages to those presently of other persuasions, is one of those institutions undergoing a paradigmatic shift, in this case a movement right off the public church campus to a non-office, non-meeting place location. That’s a great idea. The practice of the Charlotte Diocese (started with the previous bishop) is becoming ever more important for the spiritual lives of priests, namely, to allow chapels in those residences of the priests, so that it’s also the High Priest’s house. Since we have a small parish, I try to do the Communion Calls myself, and the rectory having a chapel has the added benefit of convenience regarding the Most Blessed Sacrament. And not only for that reason, but also, of course, for prayer, and not just liturgical prayer, the occasional Holy Mass and the breviary, but in view of our Lord’s insistence that we pray always. The rectory is a place of peace, truly a sanctuary. It’s not “Father George’s rectory.” It’s the rectory of the King of kings, the Lord of lords, the Prince of the Most Profound Peace. He’s here. This is an occasion of humble thanksgiving for the goodness and kindness of Jesus, which is always a source of amazement to me. There is always, always more for us to know about God being Love. Deus est Caritas. Above is a picture of the Gospel-side of the gradines of the altar of Jesus’ little rectory. 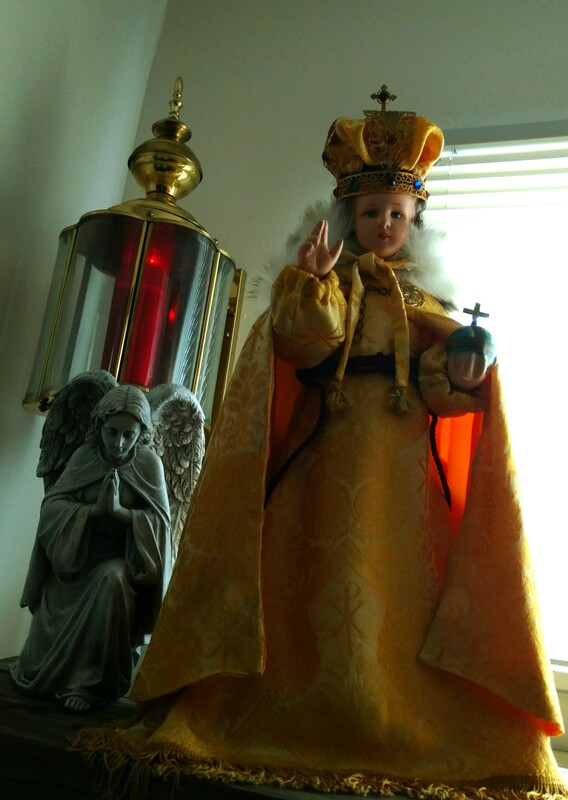 My neighbor in the days of yore, of hermitage times, is a bit of a seamstress, and, having an old humeral veil, torn in many places, she made up some regal vestments for the Divine Infant of Prague. I’ve had a devotion to Him since I myself was an infant. He has an angel, prompt and eager in service, to do His bidding. Regarding me, that also means whooping me upside the head. The angels, you have to know, are always in the presence of the Most High and see the face of our Heavenly Father. Therefore, do not offend them! They teach us reverence and humility before the Most Holy Trinity. They rejoice to see us filled with sanctifying grace. I’m happy to be in Jesus’ rectory. Lovely. It’s so nice to see and share your devotion to Our dear Lord. What a wise and wonderful bishop and what a blessing to the priests of the Charlotte diocese! Headed back home to the beautiful mountains today, can’t wait! This is such a wonderful picture. Thank you for sharing it with us.